Money, Banking, and the Financial System 2 Edition For students in the Money and Banking Economics course. This book is also suitable for readers interested in learning about money, banking, and the financial system in the context of contemporary events, policy, and business. Make the link between theory and real-world easier with the most up-to-date Money and Banking textbook on the market today! 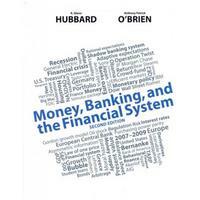 Hubbard/O'Brien's textbook presents Money, Banking, and the Financial System in the context of contemporary events, policy, and business with an integrated explanation of today’s financial crisis. Reviewers tell us that Hubbard/O'Brien helps make the link between theory and real-world easier for students! The second edition retains the modern approach of the first edition, while incorporating several changes to address feedback from instructors and students and also to reflect the authors’ own classroom experiences. Available with MyEconLab! MyEconLab is a powerful assessment and tutorial system that works hand-in-hand with Money and Banking. MyEconLab includes comprehensive homework, quiz, test, and tutorial options, where instructors can manage all assessment needs in one program. Note: If you are purchasing the standalone text (ISBN: 0-13-299491-7) or electronic version, MyEconLab does not come automatically packaged with the text. To purchase MyEconLab, please visit: www.myeconlab.com or you can purchase a package of the physical text + MyEconLab by searching the Pearson Higher Education web site. MyEconLab is not a self-paced technology and should only be purchased when required by an instructor.